Search my site here . . .
right for your best friend! to subscribe to our free mailing list. 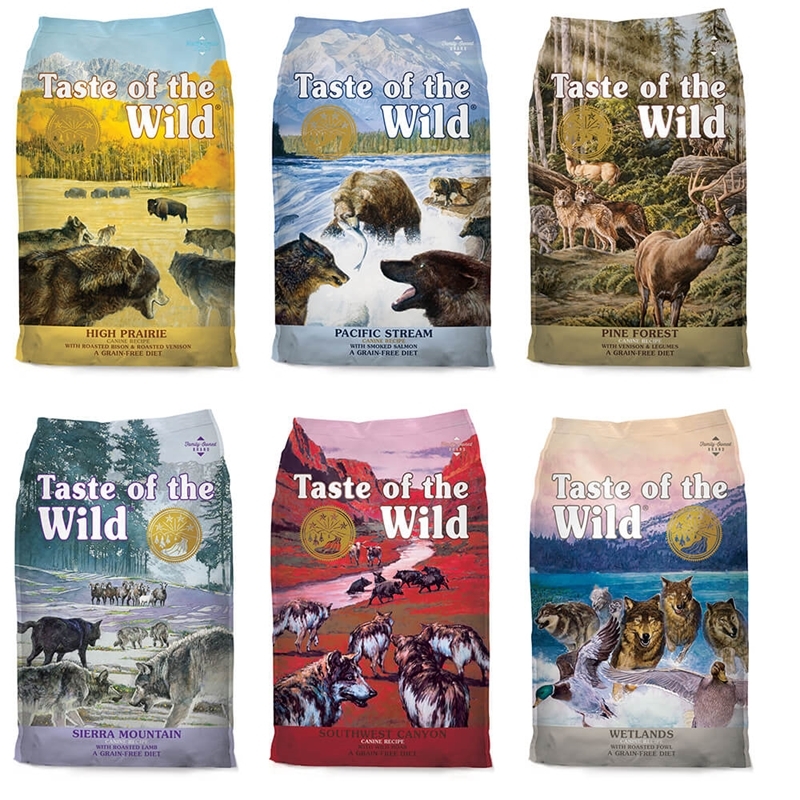 Natural dry kibble, dehydrated, air-dried and raw pet food available from a variety of manufacturers. 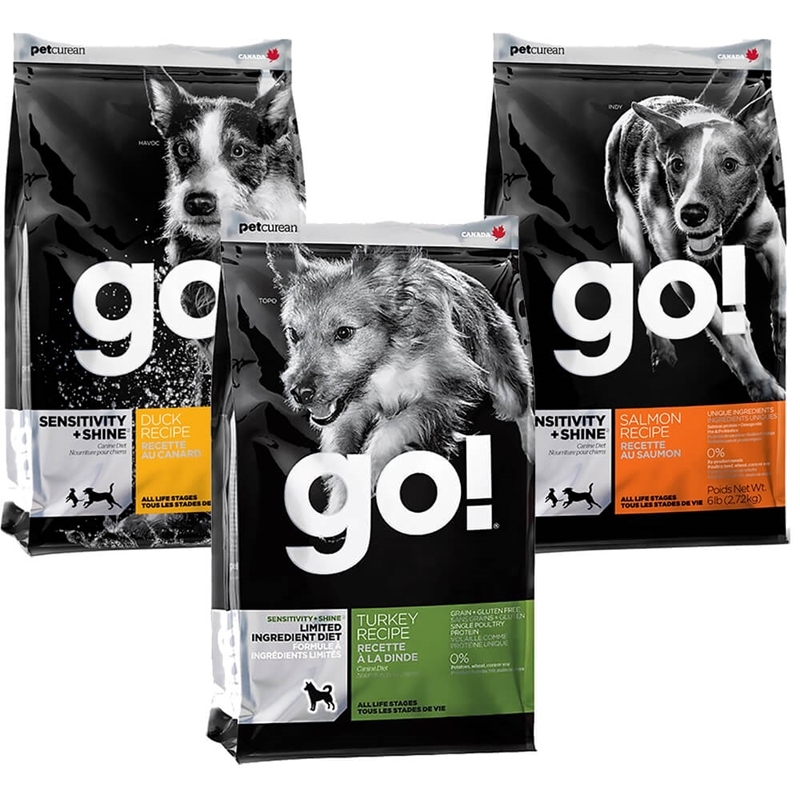 Paleo-inspired, organic, grain-free, weight management, and many other special formulas for your dog - the ingredients are pre-screened so you don't have to! Life is full of surprises.... some of them very unwelcome. Any pet can be injured or become seriously ill, even at home, but especially outdoors, whether in a yard, dog park, or out walking or hiking. It’s always best to be prepared to deal with such emergencies. Put your vet's and his or her emergency clinic’s numbers in your mobile phone or wallet, so that if their services are needed, you can call ahead and they will ready and waiting for you. 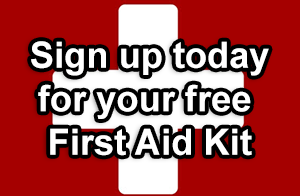 Please take a moment to read this First-Aid Pet Guide which is an excellent guide on how to treat an injured or sick dog and outlines the items necessary for an efficient and functional pet first-aid kit for use in the home and/or car in case of an emergency. 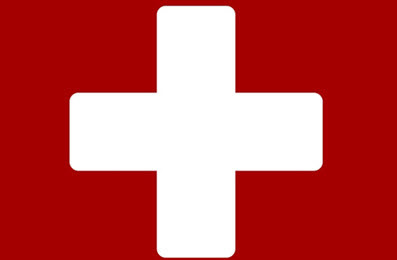 Be prudent and print a copy of the manual to keep in your first-aid kit. 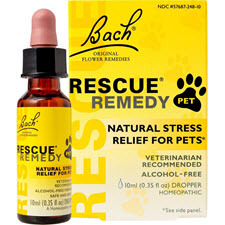 One addition we recommend to any first aid kit is Rescue Remedy.This flower essence formula can be used for an immediate calming effect in any stressful situation, or when your pet needs help overcoming a variety of emotional or behavioral problems i.e., fear of loud noises, separation anxiety, excessive barking, and more. Pet essences Pain Relief is an homeopathic anxiety formula that can help a sick or injured pet to calm down and encourage it to allow treatment. Pet essences Colitis & Diarrhea and Vomiting are 2 homeopathic digestive formulae are excellent remedies for immediate relief from acute digestive problems. While vomiting and diarrhea are rarely emergencies, when they are severe, these essences can keep your pet comfortable while you’re on your way to the vet. Pet essences Emergency is an ideal homeopathic formula to have on hand for trauma such as bumps and bruises as well as more serious trauma. If your pet is stressed, use a muzzle. For minor bleeding, such as a toenail, a styptic pencil can be used. For more serious wounds, cover the area with a gauze pad, clean cloth, or even folded newspaper (which is relatively sterile), and use direct pressure (firm, but not excessive — which can inhibit clotting) with your hands to stop the bleeding. Keep pressure on for 3 minutes, or until the blood clots is strong enough to stop the bleeding. If your dog has difficulty breathing, is pawing at the mouth, or makes choking sounds when breathing or coughing , it may be choking. Look into the pet's mouth to see if a foreign object is visible. If you see an object, you can gently try to remove it with pliers or tweezers, or slip a spoon behind it and pop it out; but be careful - it is very easy to push the object further down the throat, which could make the problem worse. Don't waste time fussing with it; get your pet to a veterinarian immediately. These injuries can be extremely painful, and can cause any pet to bite. For safety, muzzle your pet with a leash or a gauze strip. 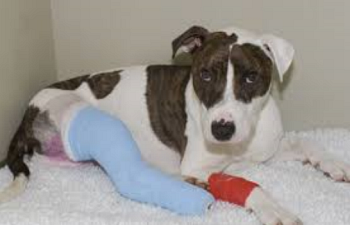 If possible, splint the leg to stabilize it for transport. 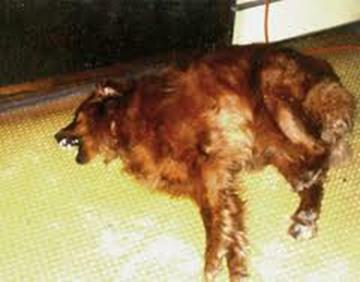 Move your pet onto a flat surface that can serve as a stretcher or a blanket or rug that can be used as a sling. Don't dilly dally, seek veterinary care immediately. If your dog can't breathe or collapses, you can do a sort of modified Heimlich maneuver. Lay him or her on its side, place your hands on the rib cage, and apply firm quick pressure, or strike the ribs firmly with the palm of your hand a few times. The idea is to push a burst of air out of the lungs to eject the object out from behind. Repeat until the object is dislodged or you arrive at the vet's office. Emergency treatment and first aid for dogs should never be used as a substitute for veterinary care, but it may save your pet's life on the way to your vet and or emergency veterinary facility. Remember, a sick or injured dog may well be in pain, scared, and confused, which can make it unpredictable. Even the calmest, gentlest dog may bite if injured. Handle your pet with a light touch and appropriate caution, and keep your hands and face away from its mouth. Most products that are dangerous for people are also harmful to pets. However, things like chocolate, macadamia nuts, raisins, and drugs like acetaminophen and ibuprofen are also toxic to pets. Never give a human medication to your pet without specific instructions from your vet. If you know or suspect that your dog has eaten something toxic, contact your veterinarian, emergency clinic, or Animal Poison Control Center hotline (888-426-4435, available 24/7) immediately (there is a fee for the consultation). Do not induce vomiting unless instructed to do so.If your pet has already vomited, collect any remnants of the item or substance in a plastic container and take it with you to the vet. If your dog’s skin or eyes have come into contact with a toxic substance (such as cleaning products), wash it off with plenty of water and mild soap if needed. Do not get soap into the eyes. If the eyes are affected, flush with a steady, gentle stream of cold water. When your dog has a Seizure, you can help it most by remaining calm. Don’t try to restrain your pet, never put your hands near your his or her mouth during a seizure, but do move them away from furniture or other objects they may hit or hurt themselves on. If possible, time the length of the seizure and observe your pet carefully so you’re able to give your vet as clear, and accurate, account of the event as possible. Contact your vet.